Here we are now. Three years have passed since Meles died in office after 21 years in power. Once again Ethiopia's food crisis is topping the headline. As seasonal rain fails in Eastern and Southern parts of the country, famine is threatening millions of Ethiopians. The UN estimates over 10 million are in need of emergency food aid. Many experts relate Ethiopia's cyclical famine with the country's dependence on Rainfed smallholder agriculture, drought, rapid population growth or agricultural market dysfunctions. Although these factors do have significant role in the matter, they tend to hide the critical cause of hunger in the country - lack of rights and accountable government. Nobel Prize winner and economist Amartya Sen has extensively analyzed the relationship between democracy and famine in his book Development as Freedom. Sen argues democracies don't have famines, only authoritarian systems do. Famine tend to happen in places where the victims are oppressed by dictators. During 1983-1985 the worst famine in the country's history had led to more than 400,000 deaths. Extensive investigation by Alexander De Waal in his book Evil Days: Thirty Years of War and Famine in Ethiopia has found "more than half this mortality can be attributed to human rights abuses that caused the famine to come earlier, strike harder, and extend further than would otherwise have been the case." The military government is not only spent between $100 and $200 million to celebrate the tenth anniversary of the revolution while millions are starving, Mengistu's regime also attempted to impose customs duties on aid shipments. Similarly during the 1973-1974 Wollo famine, attempts to hide the reality of the situation by the Imperial Feudal System caused 300,000 deaths. This particular famine was not a problem of food shortage in the country but lack of ability to access food. The Ethiopian Ministry of Agriculture Report of 1972 stated that output for 1972-1973 was only 7% lower than the previous year. Also, food price in Wollo were no higher-often substantially lower-than elsewhere in the country. The problem was the poor just couldn't afford to buy. Meanwhile, Emperor Haile Selassie spend some $35 million to celebrate his eightieth birthday in 1973. 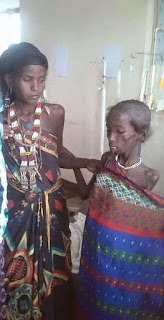 Unfortunately the trend of autocratic-led hunger has not changed under the current government either, if anything Meles's regime took it to the next level. In 2004 Humanitarian Exchange Magazine exposed that disregarding experts advise that the situation in the country was very severe and does qualifies as a famine, the government of Ethiopia and USAID conspired to downplay the 2002-2004 food crisis as "localized famine" in fear of global media attention and political dangers for the EPRDF. The report states "the lack of classic famine images....facilitates further disengagement by the media and Western publics, even as large numbers of vulnerable people face destitution, malnutrition, morbidity and mortality." After denying the problem for weeks; the government finally admitted to it but only to claim that it has enough food stock to tackle the problem. However, journalists on the ground has reported the government's grain reserve has run out long ago. According to Barrie Came, WFP representative, the food supply by the UN is also not enough to curb the problem. The government also argues the country has already realized food security at a national level, that is to say we have enough food in the country to feed everyone. The inherent flaw in this argument is that the presence of food in the country doesn't necessarily mean those affected by drought will have access to it. As it was the case during the 1973 Wollo famine, when a crop fails it not only affects the food supply, it also destroys the employment and livelihood of farmers, denying them the ability to buy food from the market. Why is the Ethiopia government acting so irresponsibly? The answer is simple - because there is no incentive for the government to work hard to avert famine. Amartya Sen argument related to absence of political incentives generated by election, multiparty politics and investigative journalism is also true in the case of Ethiopia. The EPRDF led government has successfully wiped out all groups that might pose any form of threat to its power. Fresh from its 100% "election" victory, with very fragmented opposition parties, no civil society and no scope for uncensored public criticism, Hailemariam's regime don't have to suffer the political consequences of its failure to prevent famine. If there were a democratic system to keep the government accountable, the state's response would have been much different. For instance, Botswana, like Ethiopia, is prone to drought but a democracy since its independence in 1966, Botswana never had a famine. Botswana's democratic government immediately deploys relief efforts during every drought, and even improves them from one drought to the next. Had the government in Botswana failed to undertake timely action, there would have been severe criticism and pressure from the opposition and maybe even bigger political cost in future elections. In contrast, the Ethiopian governments did not have to worry with those prospects. Another Sen's key argument is information flow and free press - democracy contributes greatly to bring out information that can have an enormous impact on policies for famine prevention. If it weren't for the foreign media reporting and social media activists outcry, the government might have kept the current problem a secret for long and caused much greater damage than it already has. In Sen's words "free press and an active political opposition constitute the best early warning system a country threatened by famine can have"
If aid organizations comprehensively and immediately deploy humanitarian assistance, the current crisis could be impelled with minimal damage. However, the argument that famine in Ethiopia is caused by drought doesn't hold water anymore. Unless the problem is addressed from its roots, another famine is just a matter of time. For Ethiopia to truly achieve food security and avoid any dangers of famine in the future, nothing but building a democratic, transparent and accountable system is the solution.